A premier manufacturer of waterfront equipment, docks and boat lifts. The customer wanted to improve the quality and appearance of lifting cables used on their products. The current design worked satisfactorily but it looked bulky and a bit antiquated. They approached Assembly Specialty for an assessment and recommendation. The original assembly was a stainless steel cable with a threaded ring eye attached to the rope via a swaged loop secured by an aluminum sleeve. The threaded shank of the ring eye was affixed to an anchor point with a hex nut. It was then covered with a sheath to prevent any exposed wires from harming an operator’s hands. 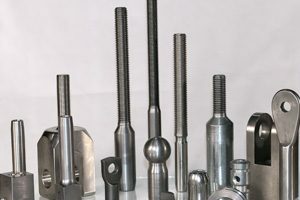 The first option was a threaded sleeve that would be manufactured and installed on the cable by Assembly Specialty and the sleeve would be threaded after swaging. This solution met the manufacturer’s desired requirements and actually reduced the cost, but the customer preferred to keep the production in-house. 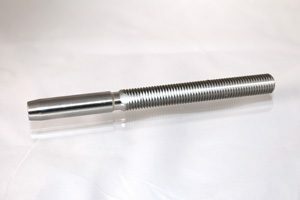 The second and preferred solution was a threaded stud that we designed and produced that the customer could install themselves. In order to achieve the lowest cost, highest quality and maximum function, the fittings were attached with custom hex dies also produced by Assembly Specialty. The swaging dies secure the fittings to the cable and form a hex configuration on the stud shank, which provided a wrench grip while simultaneously swaging the fittings onto the wire rope. This solution cut production time to less than one third, enabled production to remain in-house and produced a superior product: an assembly that is more efficient to manufacture, more cosmetically appealing, safer and easier to use. This was accomplished at the same cost as the original part. Are you interested in managing production expense to improve profitability? See a gallery of our wide range of fittings.